Sunshine Pillows is a company that sells travel neck pillows and different kinds of heating pads. 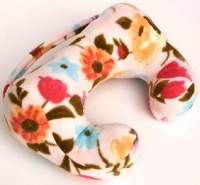 I chose the Ergonomic Travel Neck Pillow in size medium in the floral print fleece. This retails for $29.95. This size fits most adults which is great because I can share it with others now. Firm at the head area to provide strong support. Narrower and softer at the cervical area -- This makes it easy to fit in the small space between your neck and the car seat. Enlarged end portion of the pillow legs provides chin support to prevent head-nodding while you nap. Zipper opening allows easy adding or removing of stuffing for self-adjusting firmness. This pillow could not have come to me at a more perfect time. I was literally walking (okay running) out the door to pick my husband up from work for our three day weekend. I was exhausted from a busy work week and needed a little nap on our 4 hour car ride to my parent's farm. I used this pillow the whole way and loved it. It was comfortable and like nothing that I had ever had before. It was not bulky which was nice. My dogs even enjoyed snuggling up into it! I really like the pretty floral pattern too. This will be used for many car trips in the future! The giveaway will be for the floral travel neck pillow (seen in the picture above) to the lucky winner of this giveaway. The giveaway is open until Midnight on Tuesday May 10th. Winner will be chosen on Wednesday May 11th using Random.org. The winner will have 48 hours to respond or a new winner will be chosen. ***Giveaway is open to US readers only. Visit the Sunshine Pillows website and let me know which product appeals to you the most! -Follow Sunshine Pillows on Twitter (2 entries). -Like Sunshine Pillows on Facebook (2 entries). Since I suffer from chronic neck and lower back problems, there were a LOT of items on this site that appealed to me! I especially liked the Lavender-scented Ergonomic Wrap Around Travel Neck Pillow! A lot of these items appeal to me but I really like the microwavable shoulder heating pad. I am subscribing by email now! I entered the Contigo waterbottle giveaway. i like the ergonomic neck heating pad. I like the Large Microwavable Lavender Shoulder Heating Pad Strong Aromatherapy. I follow Sunshine Pillows on Twitter as BookOwner. hubby has a bad shoulder, so I like the Unscented Navy Blue Large Soulder Heating Pad because that would be good for him. your GFC follower Michele P.
#1 I'm an email subscriber. #1 I Like Sunshine Pillows on Facebook. #2 I Like Sunshine Pillows on Facebook. I entered your Teamotions Tea giveaway. I entered your Rudi's Organic Bakery Giveaway. I entered the Food You Should Taste giveaway. I like the lavender-scented neck pillow. I entered the Minly couture blanket giveaway. I love the lavender beck wrap most! I really liked their large heating pad !!! Hard to find these !!! i love the extra large heating pad! I like the Lavender Scented Shoulder Heating Pad. Wow- the microwavable shoulder heating pad sounds heavenly. The Lavender-scented Shoulder Heating Pads sound great! This would be amazing to win with my neck problems! 1. I like Sunshine Pillows on FB. Samantha M.
2. I like Sunshine Pillows on FB. Samantha M.
The Extra Large Heating Pad For Back Pain Relief sounds good. I like the microwavable shoulder heating pad.